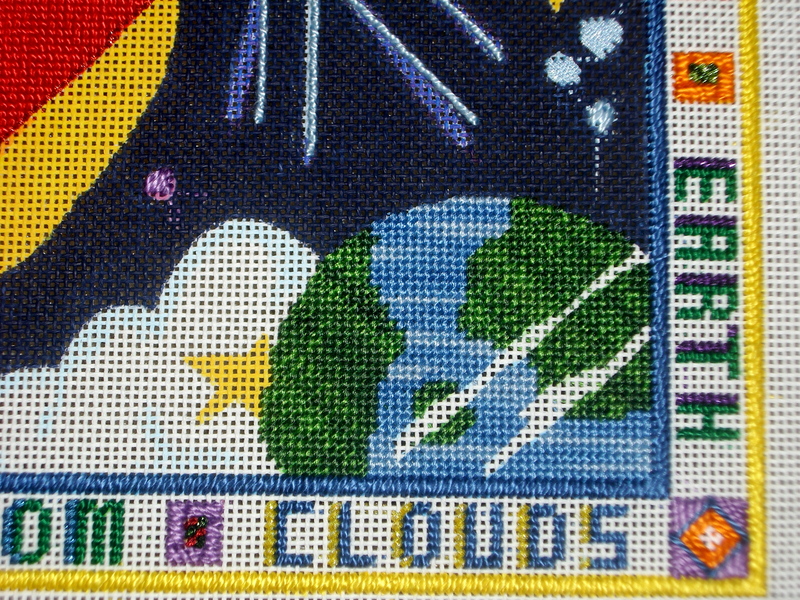 Since my last post, I’ve been busy working on the border of the Space-With-Borders needlepoint. I stitched all of the words in perl cotton, then added the highlighting in the metallic threads. 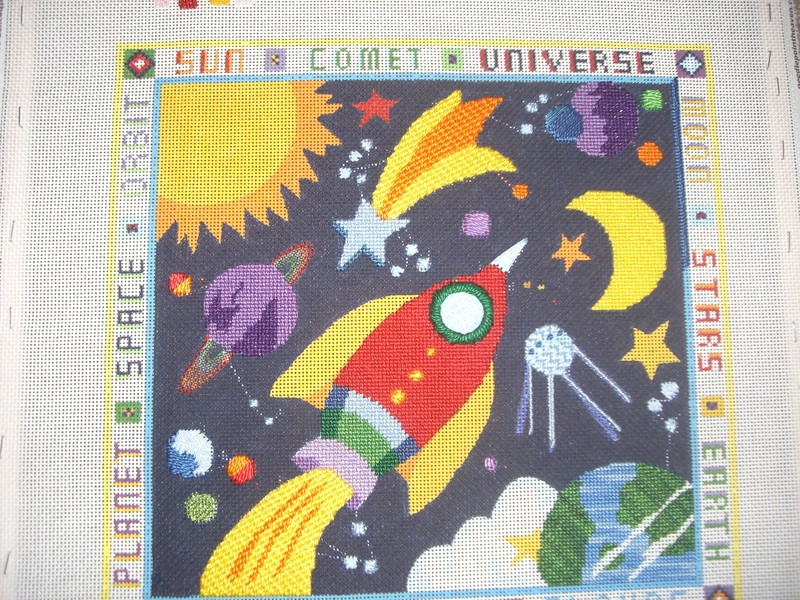 The corner pieces I stitched with long stitches, leaving the center blank. I’m thinking of adding beads here at the end of the piece. For the boxes in between the words, I used french knots for the center color. I’m thinking of taking the stars out of the piece. All of my attempts so far to stitch them have come out not to my liking. 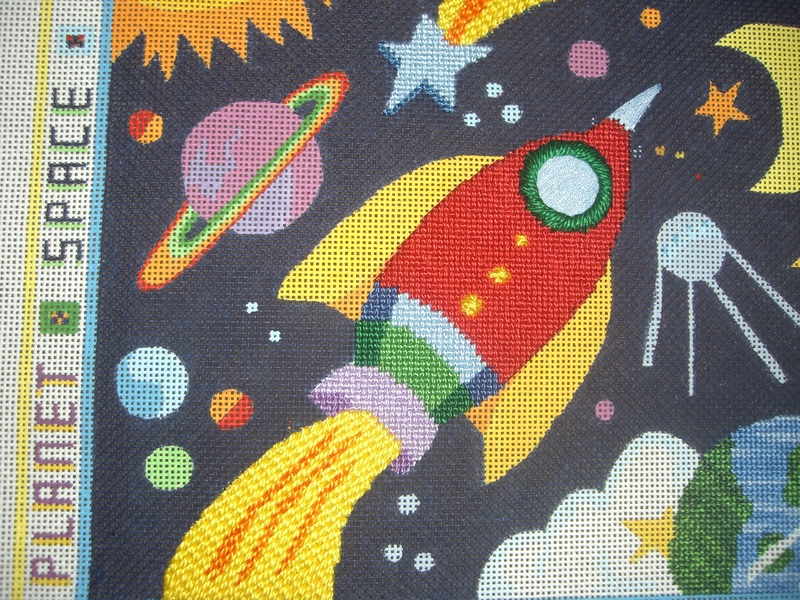 Any suggestions on how to stitch the stars? My Very Educated Mother Just Sent Us Nine…. 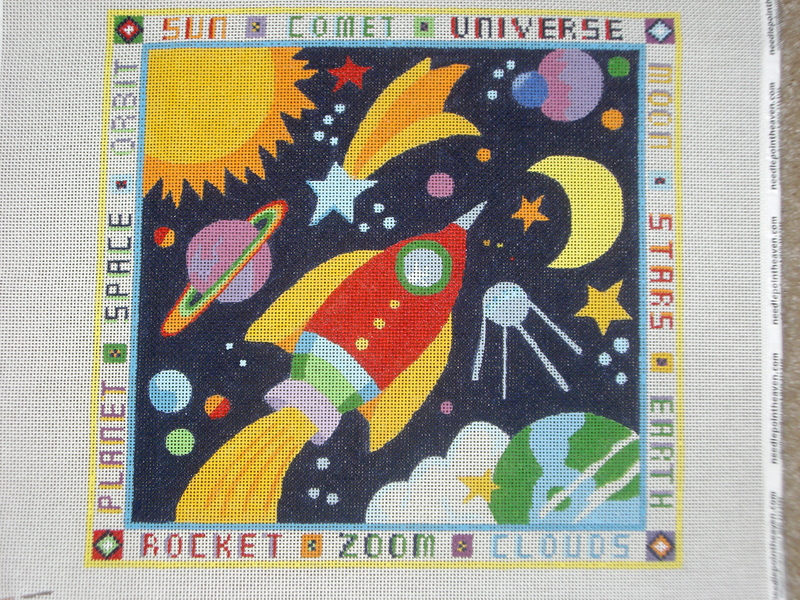 Growing up, there were 9 planets in our Solar System. Now, I think there are just 8. Luckily, I haven’t had to teach this yet in my career. 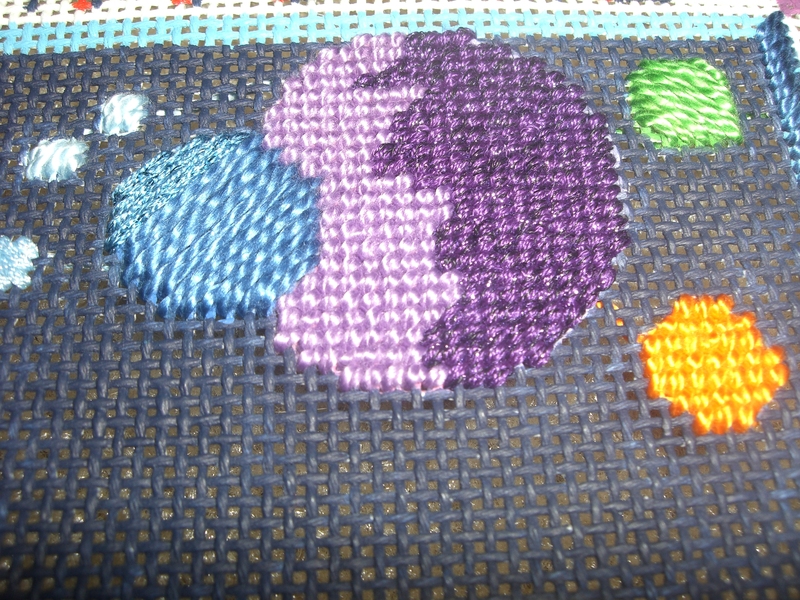 Hey, speaking of planets…I finished stitching all of the planets on my piece for the baby! I decided to stitch most of them with a satin stitch. 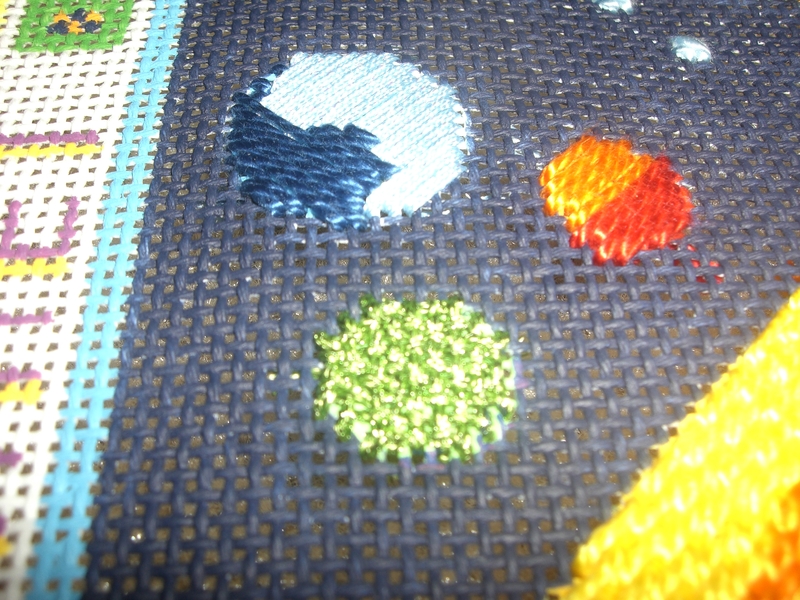 I think this looks much nicer than a tent stitch, and may end up pulling the last of the planets left in tent. I have had a lot of fun working with different types of metallics here. I think they add just the right amount of interest to the planets. 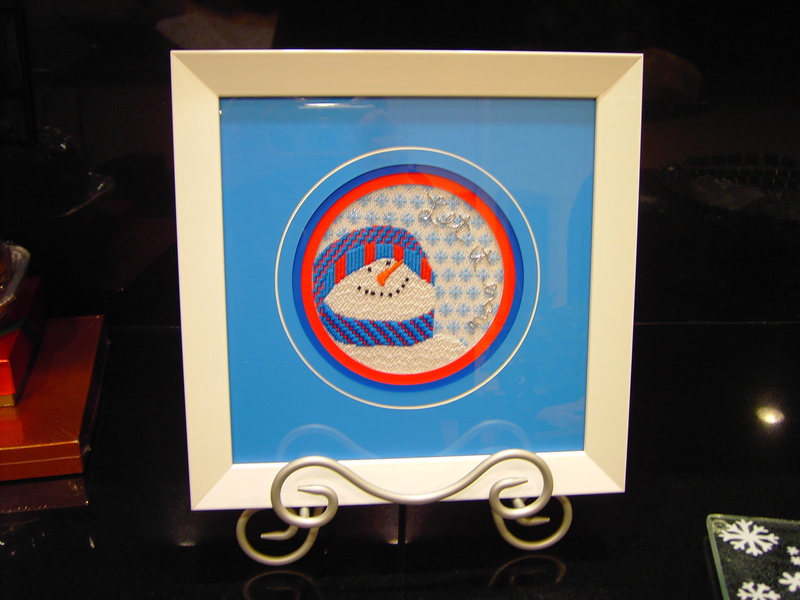 I also stitched the moon. 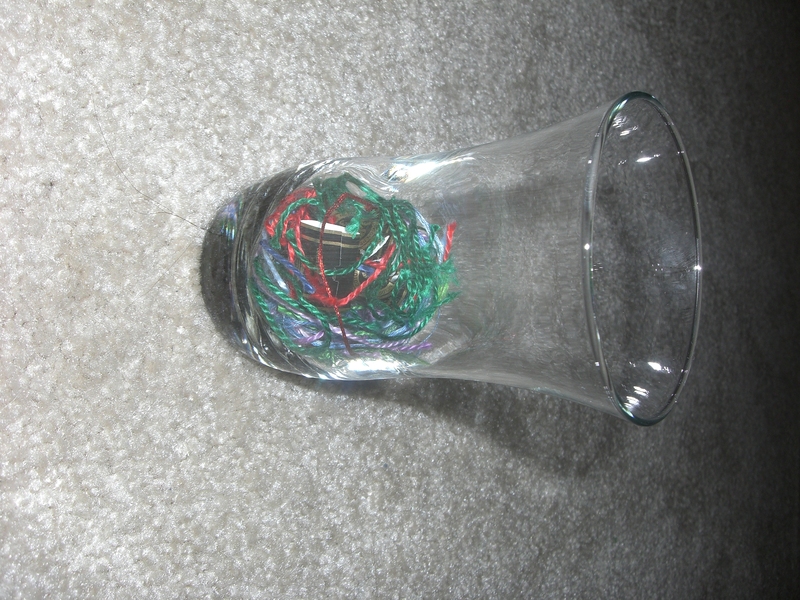 When I went to my LNS last weekend with a friend, I picked up some glow-in-the dark thread for the moon. I picked up blending filament and planned on stitching it over the perl cotton, but when I checked the glow effect, I thought it would be a little scary for a small child. In an effort not to scare the baby, I pulled it out. I need to find a way to work this into some piece in the future though! So, here are my planets. 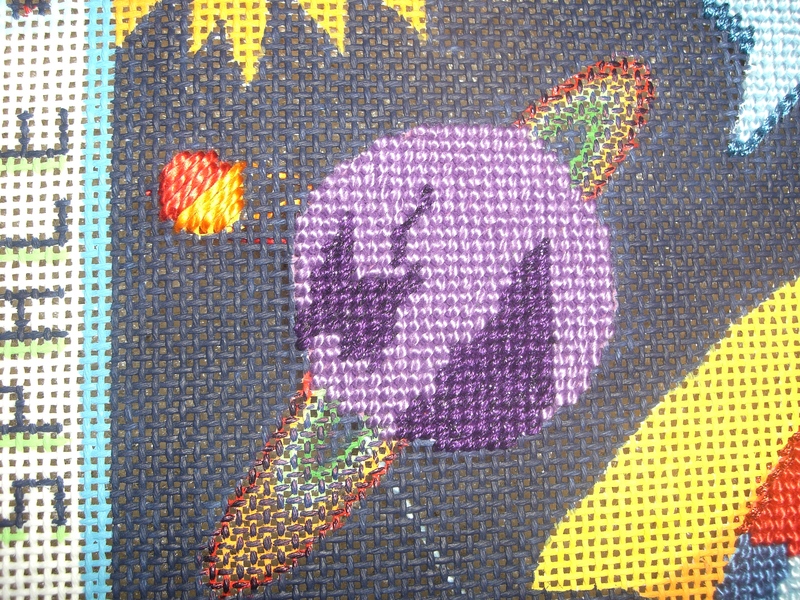 I changed my mind again about how I want to stitch the sun. I picked up some floss and matching beads. 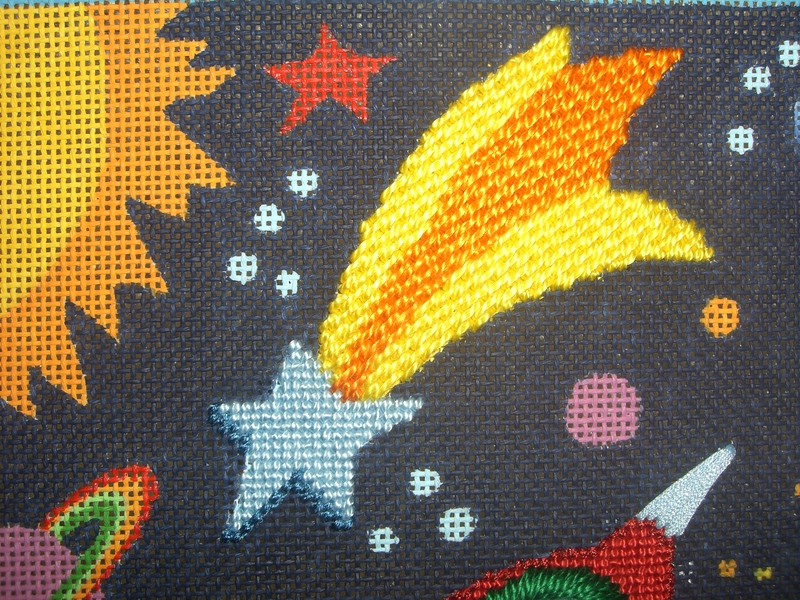 I think this will be a lot more fun to stitch than Flair/Frosty Rays…and beads give that extra sparkle. So, no more french knots. 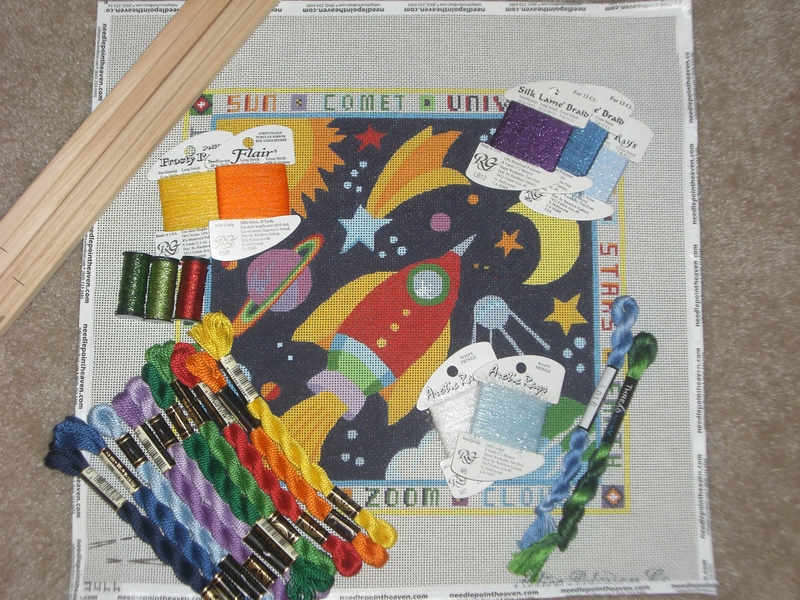 We’ll see if this is still the gameplan when I get around to stitching the sun. As a pre-school teacher last year, I was introduced to a lot of new children’s television programs. I watched several of them to know what my students liked and how to talk to them about the show. Many of these shows were painful to watch (read: Yo Gabba Gabba). Little Einsteins, however, was actually quite well done. The title of this post comes from their theme song, and I definitely recommend this show to any parents looking for interesting television for their little ones that won’t make them want to pull their hair out (read: Yo Gabba Gabba). So, back to rocket ships. 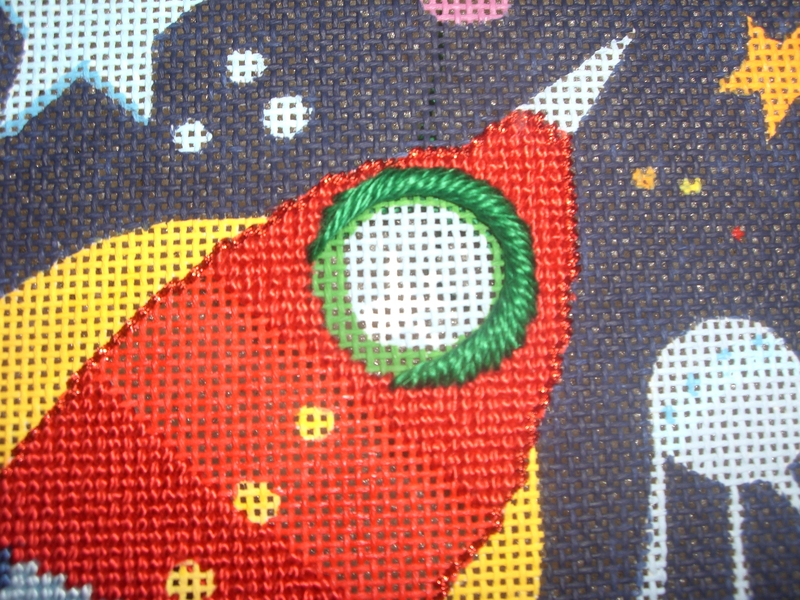 When we last left off, I was trying to figure out how to get the buttonhole stitch to work around the window. Before attempting again, I remembered the lesson from this month’s Cyberpointers meeting, which was on Hilton Stitches. I decided to try my hand at the Jessica stitch. Then I realized that it would be very difficult to get the blue underneath all of that stitching, so I ripped it out and tried again. It’s not a perfect Jessica, and I know I made a few mistake on the last section where you have to tuck your new stitches under your old stitches, but I think it looks pretty good. 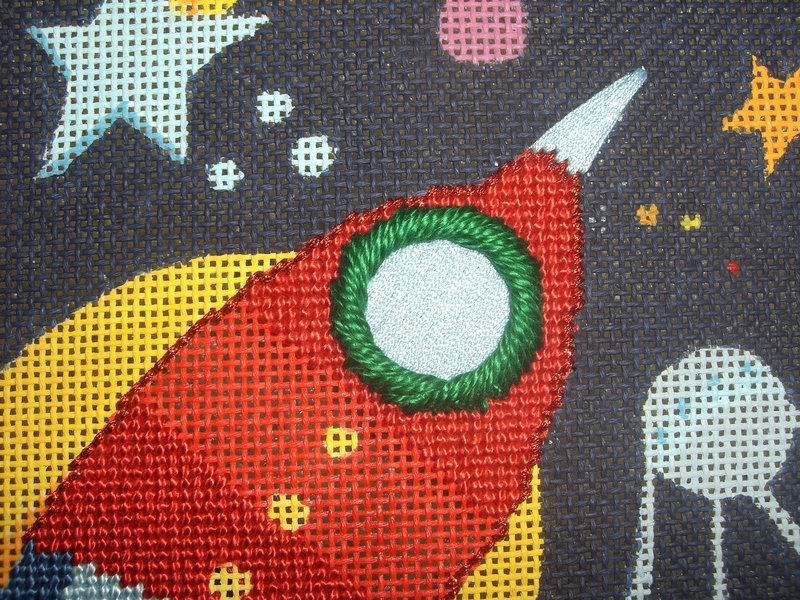 I also added the buttons and fire trail to the rocket. 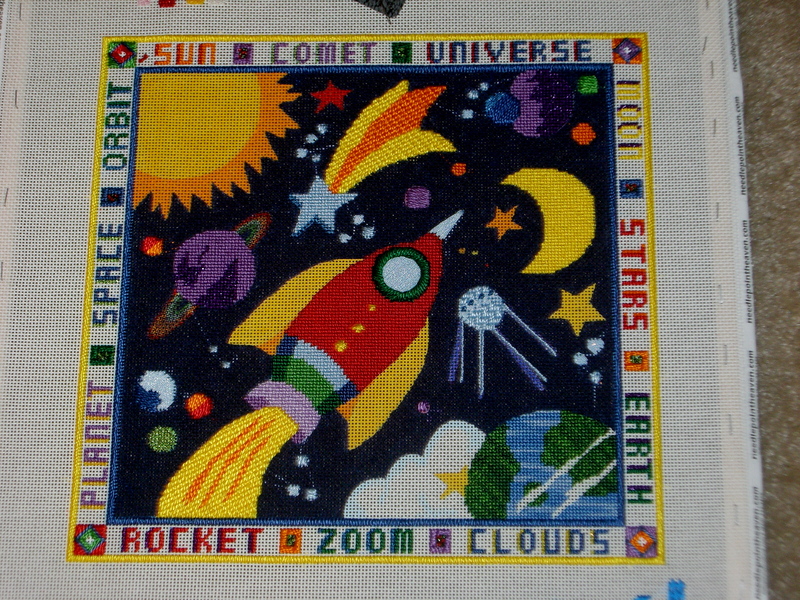 The only thing left now are the wings, and I think I’ll wait and stitch them later (padded satin stitch maybe?). My last bit of progress was on the shooting star. 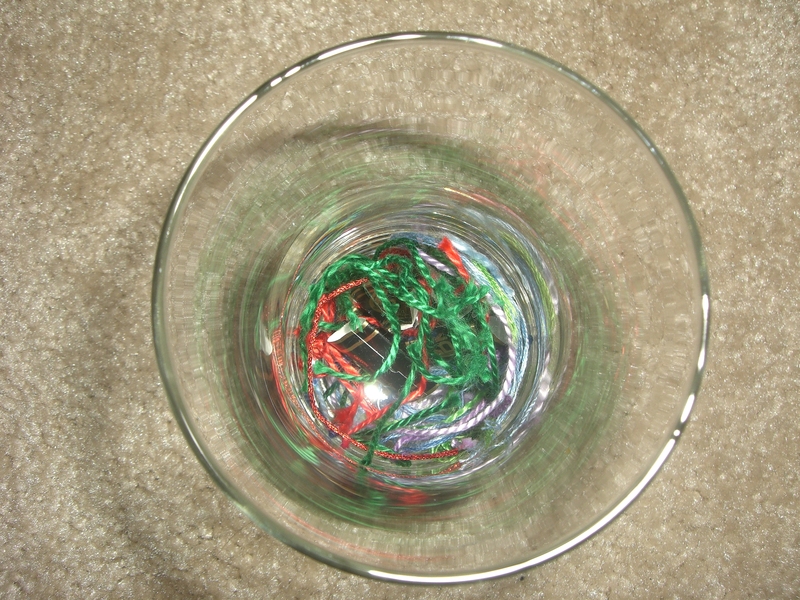 The darker blue metallic is the Silk Lame Braid. It’s very easy to work with, but for some reason my scissors did not enjoy cutting it. Climb aboard, get ready to explore There’s so much to find, Little Einsteins. 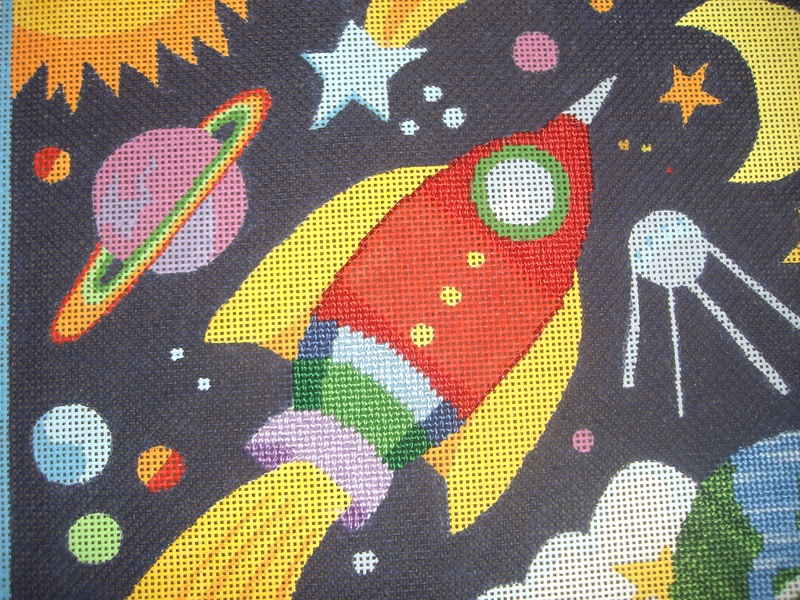 I have started working on the Rocket Ship in the piece for the baby. I’ve stitched the purple, blue, and green, and started the red. For the red, I added a sparkly border in Krienik metallics. I started to work the green window port in the buttonhole stitch, but ripped it out when I realized my thread was too short. Any suggestions on how to change threads in the middle of this stitch? If it doesn’t work, I’ll have to switch to another stitch because I have precut all of my floss to the same length. Whoops! I’m still fighting a cold, so – off to go spend the evening stitching! Sorry for that hiatus. I spend 2.5 weeks with my family in NJ, and actually didn’t stitch at all there. I was planning on working on a few of my mom’s WIP, but instead I read A LOT! Every year my dad (and before him my grandparents) gives me a bag of books. Although they are plentiful, they usually last only a few weeks. I worked as hard as I could to read them before heading back to CA. It was a tough job, but I loved every minute. I still have a few more to go, but reading helped make my luggage just a bit lighter. They chose this piece – Space with Borders by Alice Peterson. 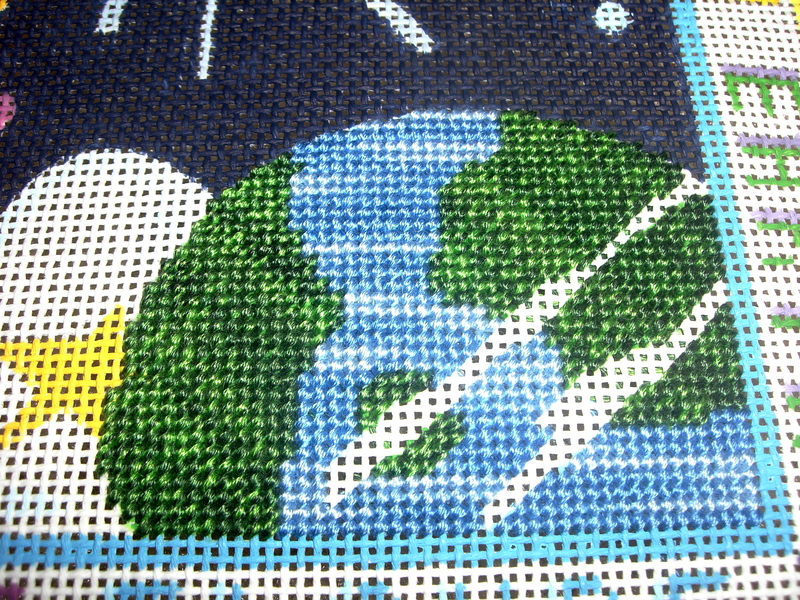 I started this project with our home planet – the Earth in the corner, working with the green and blue Threadworx floss. I started working the green in basketweave, but I didn’t like the diagonal lines the overdyed was making. So, I pulled that out and reworked it using 3 strands of floss in one orientation and 3 strands in the opposite orientation. This make the color changes look much more natural. I stitch the blue in continental with all 6 strands in one direction. I love the look of the water! One thing I learned from this is the difference between basketweave and continental in terms of coverage. Wow! When I hold it up, the basketweave has very little light coming through, whereas I can see small wholes in the continental. I think I’m a basketweave convert now. Happy Hanukkah all! And almost a very Merry Christmas. I have been very busy this past week finishing up our last week of work before a long vacation! After tomorrow, no more work until 1/4. Which means, of course, that I’m taking the red-eye to NJ tomorrow night and not returning until 1/3. I can’t wait!!! Speaking of Mom, she got the Snowman back from the framer today. I wasn’t involved in the process, other than to suggest that she make it into a piece that goes on as stand rather than the wall due to its seasonality. I think she did an AMAZING job choosing the mattes and frames. I love it!! !